VPL Terms and Conditions: New CRF50F, Subject to model and colour availability. Representative Example based on 2 years 0% VPL. Offers applicable at participating dealers and are at the promoter's absolute discretion. Indemnities may be required in certain circumstances. Finance is only available to persons aged 18 or over, subject to status. All figures are correct at time of publication but may be subject to change. Credit provided by Honda Finance Europe Plc. Cain Road, Bracknell RG12 1HL. Honda Finance Europe Plc is authorised and regulated by the Financial Conduct Authority, Financial Services Register number 312541. 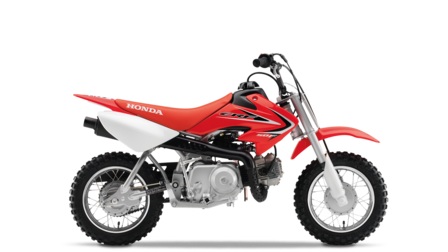 Widely recognised as the quintessential mini bike, the CRF50F is Honda’s longest-running off-road model and the choice of first-time riders the world over. Its inverted fork, 49cc four-stroke engine, easy-shifting three speed gearbox with automatic clutch and low 548mm seat height make the CRF50Fa cinch to ride. Built strong and solid, with aggressive big bike styling and racy new graphics, this CRF will soon have the fun meters of the smallest riders in the family running red - Honda red. Dependable 49cm3 SOHC four-stroke engine develops smooth, easy-to-use power. 10 : 1 compression ratio ensures good performance. Maintenance-free Capacitor Discharge ignition (CDI) and automatic camchain tensioner. 11mm piston-valve carburettor offers excellent fuel mileage and throttle response throughout the rpm range. Durable #420 drive chain provides dependable operation and low maintenance. Exhaust silencer equipped with spark arrester provides efficient and quiet operation. Inverted telescopic front fork offers a plush 87mm of suspension travel. Front suspension spring and damping rates engineered to provide optimum rider comfort and bump absorption. Single-shock rear suspension supporting a reinforced swingarm provides 70mm of well-damped travel. 28-spoke, 10" diameter wheels with die-cast aluminium hubs look great, provide excellent manoeuvrability and offer smooth ride quality. CRF-R-inspired bodywork and colours with new graphics. Low-emissions engine design meets the most rigorous off-road emissions standards. Narrow, 110mm-wide race-style seat, slim fuel tank, and extra-low, 548mm seat height provide excellent comfort and mobility for a broad range of young riders. Keyed ignition switch prevents unauthorised use.